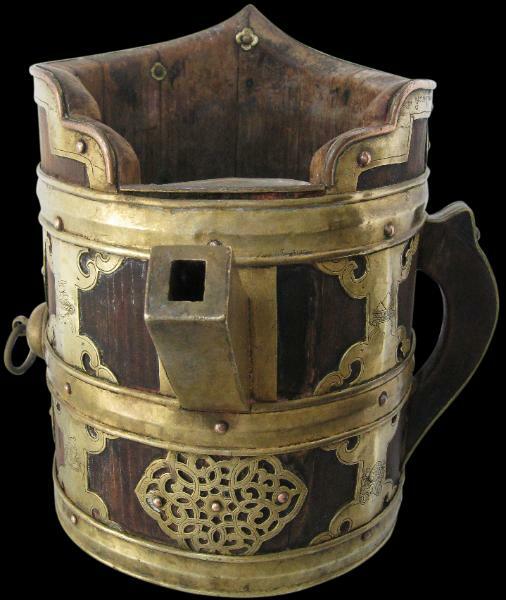 This large and striking vessel is used for holding and pouring yak butter tea. It comprises a thick wooden interior encased within engraved brass mounts, in the shape of the curved brim of a Tibetan monk’s cap. 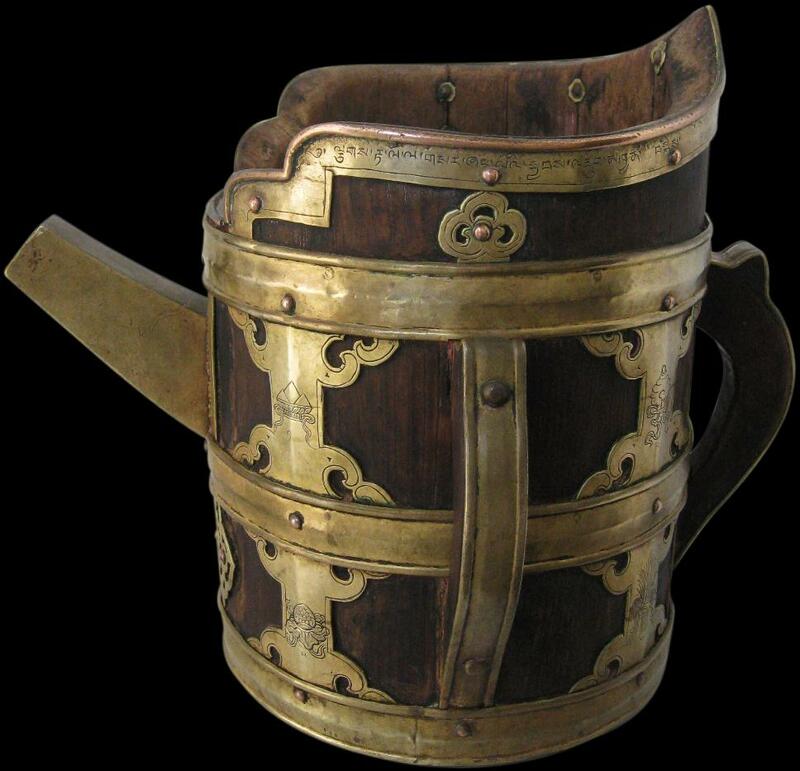 It has two prominent handles, a large, thick spout, and on one side, a ring to allow the vessel to be hung when not in use. 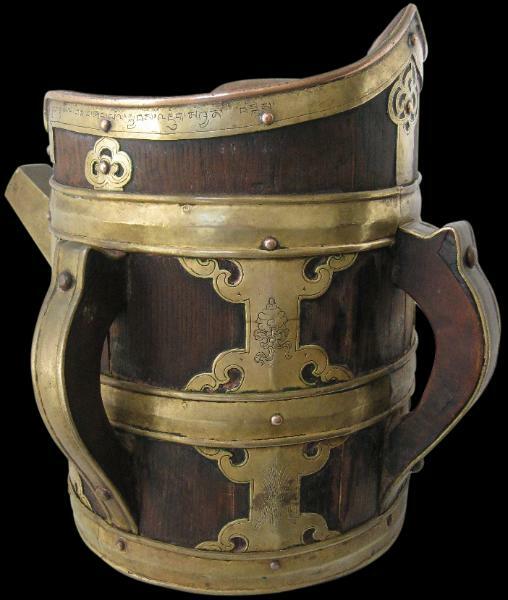 The brass mounts are engraved with various Tibetan Buddhistic emblems, and along the top rim and on the top plate over the spout, engraved in fine Tibetan script is an inscription which translates as: ‘Newly made in the iron horse year by favour of our uncle, Happiness’. This inscription suggests a date for the vessel. ie given a numerical name) but were associated with both an animal and an element. Animals have the following order: Hare, Dragon, Snake, Horse, Sheep, Ape, Bird, Dog, Pig, Mouse, Bull, and Tiger. The elements have this order: Fire, Earth, Iron, Water and Wood. The element-animal designations recur in cycles of 60 years beginning with a (male) Wood-Mouse year. These large cycles are numbered, the first cycle starting in the equivalent of AD1024. This vessel, being dated the Iron Horse year allows several possible datings at 60 year intervals. The likely approximate corresponding Gregorian calendar years for the Iron Horse year are 1750, 1810, 1870 and 1930 of which 1810 or 1870 seem the more likely given the apparent age of the item, although a similar vessel was offered at Christie’s London, in their ‘Islamic, Indian, Southeast Asian Manuscripts, Miniatures and Works of Art’ sale of June 13, 1983 and this example was attributed to ‘circa 18th century’. Overall, this large vessel is both decorative and formerly utilitarian. It is in very good condition with a fine patina. Christie’s London, ‘Islamic, Indian, Southeast Asian Manuscripts, Miniatures and Works of Art’ June 13, 1983.